You might have noticed recent inactivity on the news feed. However, in the following days, I will provide reviews for the latest rivals on DavidNews.com HYIP monitor. In total, we have 4 new HYIP’s and I will begin with a HYIP called Earnestic. This program joined Golden Stage on the DavidNews.com monitor at the end of the September 2017 and it has been online in total for 14 days. Basically, we have two weeks old HYIP and it’s about the time to look under the hood to find out more about its potential. Now I have reinvested in it $400 and will keep you updated with the payment status. Let’s begin with the legend where HYIP admin usually has a full creative freedom to express their creativity and craft of writing a good company biography story. In this case, the Earnestic admin has written a very generic story about making money in the cryptocurrency market. Often, I read very complicated and twisted HYIP stories, which don’t make sense. However, this is not the case this time because Earnestic legend has a lack of details in it. Basically, they talk out and about but don’t mention their sales point. From legend, I can understand that admin is against the cryptocurrency mining because it’s too expensive. Second, admin claims that “The higher amount we use for trading, the higher amount of returns we can make”. I believe we can use this sentence opposite – the higher amount you use for trading, the higher amount you can lose. Sure, legends have nothing to do with the completion of investment cycles, but this legend gave me a feeling either the admin was too lazy to write a better legend or he/she doesn’t have a profound understanding of cryptocurrencies, which is fair enough. Let’s hope they manage to attract enough investors to complete several investment cycles. Earnestic has registered a company in the UK. It’s called Earnestic Investments Limited. On the Earnestic website, I couldn’t find a company registration certificate or company registration number. However, company name provided on the website is available on the Companies House register. There are company registration details for EARNESTIC INVESTMENTS LIMITED and this company has the same address as it is provided on the website. Usually, HYIP admins tend to use it as a trust element, but for some reason, admin doesn’t mention it on the Earnestic website. Different company registration and HYIP launch dates might be the reason. The website has been online for two weeks, but the company has been incorporated on the 2nd of October. 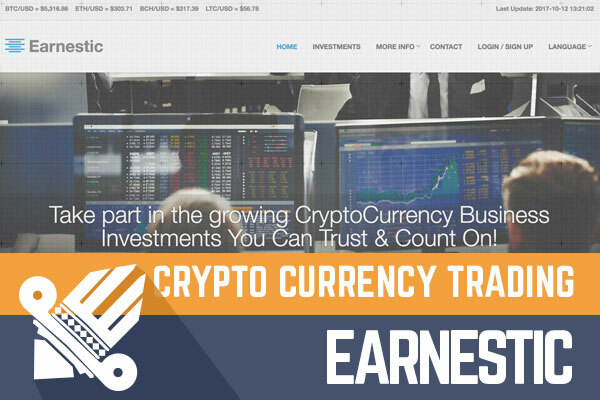 The color palette used in the Earnestic website makes this HYIP look like a professional financial service. Even though homepage doesn’t have too much content, there is all important information available within a few clicks. The website has a Multi-Domain SSL certificate assigned by COMODO CA Limited. I don’t see yet any reference to other HYIP’s owned by this admin, but who knows what interesting facts might appear by the end of the review. There are 5 language options, but 4 of them have “coming soon” message. Let’s see if any more languages will appear by the end of the first investment cycle. The web developer has done a very good job here building a minimalistic and functional website, which is also mobile responsive. Earnestic has 3 investment plans with fixed interest rates. 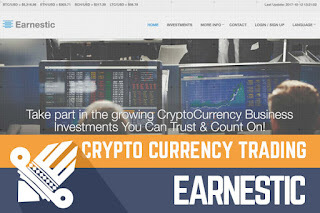 Minimum deposit to join Earnestic is $5 and there is no maximum deposit. All three plans are available for the 24 calendar days. Interest rates are from 6% - 7% daily depending on the deposited amount. The lower deposit – the lower interest rate. In the meanwhile, only the first plan is available for more investors because the 2nd investment plan has minimum deposit $1000 and 3rd - $5000. These are investments that only pro players would consider making. Keep in mind that you can withdraw the money only with the same payment system as used for adding the balance to your Earnestic account. In all three plans, the deposit will not be returned at the end of the investment cycle. There are 3 different withdrawal terms based on your investment plan. Lite – 24 hours after the request, Medium – 12 hours after the request, Earnestic – instant withdrawals. Feel free to drop a message in the chat box if you have any prior experience with Earnestic withdrawals! As I mentioned earlier, the most affordable plan is Lite with minimum deposit $5 and 6% daily rate. $200 deposited in this investment plan would make $12 a day and generate a total profit of $88. In case the Earnestic will collapse earlier than 24 calendar days, then keep in mind that your deposit would reach the break-even point after 17 days, which is approximately 2,5 weeks. Unfortunately, none of the investment plans have made so far and we can’t make any judgments or predictions. In the meanwhile, 6% daily is an average interest rate and fact that deposit is not returned at the end of the cycle makes it less risky compared to HYIP’s where the deposit is returned. We see here a HYIP with very professional and clean website design. I have no complaints about it at all. Unfortunately, the legend was not convincing for me. Investment plan with 6% daily rate and deposit included in the payments look realistic now, but as usual, we can’t read admin’s thoughts or predict the future cash flow, which has a crucial impact on the longevity of this program. Now program looks totally fine. However, all HYIP’s are highly risky and you are the only person responsible for your investments. Therefore, if you ever decide to make any investments, don’t invest more than you can afford to lose! Any interesting information worth sharing about the Earnestic? Please drop a message in the chat box! Investment plans: 6% up to 8% daily for 24 calendar days, initial deposit included in the payments.